Jeff Weber started working with books at a young age at Stanford Libraries and UCLA Libraries, followed by taking an MLS from Indiana University, where he worked briefly at the Lilly Library. Bookstore experience began with two stints with William P. Wreden in Palo Alto and ten years working for Zeitlin & Ver Brugge Booksellers, Los Angeles. With the combination of these experiences Jeff Weber has worked with many kinds of books, but emphasized the history of science and medicine and continues the same emphasis today. In addition, his grandfather, Carl J. Weber, a Rhodes scholar, was Roberts Professor of English Literature at Colby College, Waterville, Maine. His father, David C. Weber, was the Director of Stanford University Libraries, now retired, but very active with world travel, daily hikes, and volunteering for the Audubon Society. Carl J. Weber was a Thomas Hardy scholar and is remembered frequently today for his history of fore-edge painting (1949 and 1966). David Weber collected Joseph Conrad and has also written extensively in library literature as well as supporting reading and the pursuit of knowledge. Jeff Weber has continued to write and lecture on the history of fore-edge paintings. He has written five book catalogues of fore-edges, each fully illustrated. In addition, in 2006, he finished a book on the fore-edge paintings of John T. Beer, the noted late nineteenth-century artist who signed his work. These efforts have furthered the work of Carl J. Weber and shed new light on the history of this “curious” form of art and book decoration. 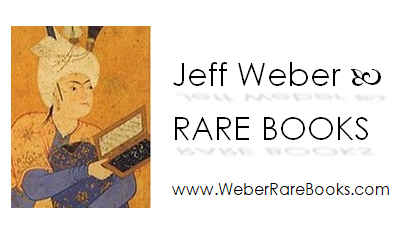 Jeff Weber Rare Books issues about ten antiquarian book catalogues per year. One can subscribe to the series or offer to buy a book on occasion, thus rewarding the client with a catalogue received in the mail – the old fashion way. This web-site offers more than 10,000 books and papers in support of the books Jeff Weber has purchased. We welcome your contact and hope to assist in your interests in reading, research or book collecting for the sheer joy of it.